Velcro is the generic brand name for a type of hook-and-loop fasteners trademarked by the Velcro Group of companies (based in Curaçao, Netherlands Antilles) and used in a wide range of applications. The idea of hook and loop fasteners was conceptualized by a Swiss engineer, George de Mestral. The inspiration came to him after examining burrs—hooked dry fruit or seeds that cling to clothing—under a microscope. Upon returning from a walk in the woods one day in 1948, Mestral discovered burrs clinging to his dog's fur. He was intrigued by their gripping power and upon examining their makeup under a microscope, discovered that they were covered with hundreds of tiny hook-like structures. These hooks clung to any material with loops, including clothing and fur. Mestral decided to design a fastener based on the hook and loop principle of burrs. It took the relentless engineer eight years to perfect his invention: two strips of nylon, one covered in thousands of tiny hooks and the other covered in thousands of minute loops. These two strips, when pressed together, formed a tough bond that could only be separated with the application of a considerable amount of force. The invention, named Velcro, was patented in 1957. According to Bob Golden and Allyn Freeman in the book “Why Didn’t I Think of That,” a 2-inch square piece of Velcro can hold and support the weight of a 175 pound person. According to Ira Flatow in the book “They All Laughed...From Light Bulbs to Lasers,” a piece of Velcro less than 5 inches square can support a weight of one ton. There are various types of Velcro, differing in size, shape and application. Industrial Velcro, for instance, consists of woven steel wire that provides high tensile bonding in high-temperature applications. Consumer Velcro typically comes in two materials: polyester and nylon. Polyester Velcro is suitable for applications where moisture and sunlight are factors. It does not degrade with excessive exposure to sunlight, and water does not affect the holding strength of its hook and loop fasteners. 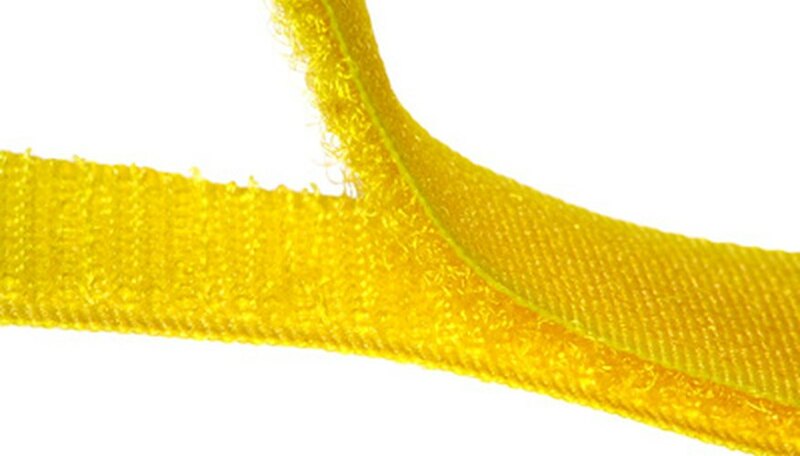 Nylon Velcro is susceptible to excessive heat, ultraviolet radiation and moisture. The major difference between these two types is their lifespan. Nylon fasteners can open and close 10,000 times while polyester fasteners have a lifespan of 3,500 openings and closings. Velcro fasteners are used in shoes and clothing to replace buttons, laces, zippers and snaps. It is useful for wall hangers, medical bandages and numerous other fastening purposes. Velcro works well on difficult surfaces, such as ceramic, glass, rigid plastic, fiberglass, metal, tile and wood. Velcro is used in the bodies of aircraft, automobiles and even spacecraft. It is a simple and lightweight way to hold down movable parts and attach exterior elements, such as headlight and taillight covers in vehicles. Gilani, Natasha. "Facts on Velcro." Sciencing, https://sciencing.com/velcro-6470547.html. 25 April 2017.